In an era marked by hyperpartisan political discourse and obsessive coverage of the personalities of the moment, it’s good to know that Wisconsinites have an objective public media resource in WisconsinEye. For almost ten years, WisconsinEye has been providing unfiltered access to public policy debate and decision-making. Their gavel-to-gavel coverage of the State Legislature, Supreme Court, and Governor’s office is completely free of editing, commentary, and analysis, offering viewers online and on television a balanced presentation of what goes on in the State Capitol and beyond. Additionally, many traditional media outlets don’t allocate resources to covering press conferences, political conventions, or events relating to public officials and campaigns. The WisconsinEye team believes that conversations outside of the Capitol can provide crucial information and context for understanding how and why legislators make the decisions they do. For instance, election law has been much contested in recent years. Between the confusion surrounding changes to voter ID requirements in Wisconsin and the allegations of rigged elections by U.S. presidential nominee Donald Trump, the WisconsinEye team saw an opportunity for clarification. They invited Wisconsin Elections Commission administrator Michael Haas and League of Wisconsin Women Voters executive director Andrea Kaminski to discuss with Walters (see above image) the new photo ID rules and the security of Wisconsin’s election system. Viewers of this episode of Newsmakers (as the series is called) learned that you do indeed need a photo ID to vote and that our election system is very secure in Wisconsin. According to the National Conference of State Legislatures, only thirty states and the District of Columbia broadcast legislative coverage, and many of these do so only through state-funded public television channels. 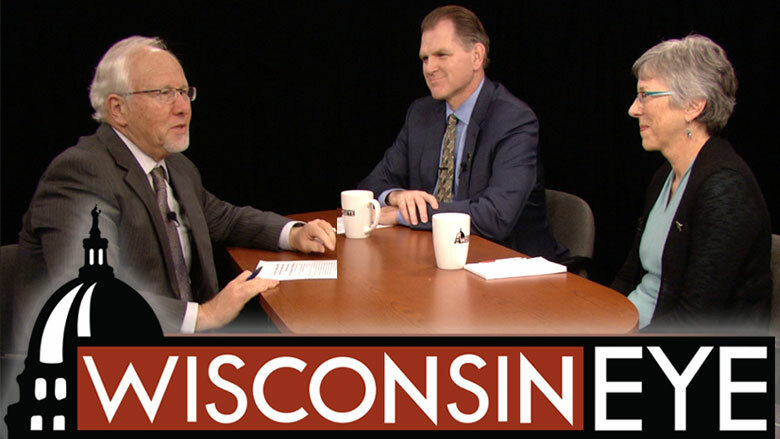 Although commissioned by the state, WisconsinEye is unique among state public affairs broadcasters because it is privately funded and operated. Henkes says that because WisconsinEye receives no state funding, the organization can retain its editorial independence no matter who is in office. “Wisconsin’s approach to this is very special—it is a national model,” says Henkes. While they may have started out as a kind of “C-Span for Wisconsin,” WisconsinEye today is also producing original documentary content that explores topics of statewide importance. While the series on dementia is aimed at Wisconsinites over age fifty, the WisconsinEye team is also working with statewide shareholders to create a peer-to-peer documentary that features high schoolers speaking provocatively to each other about opiate addiction. Whether it is election law, changing demographics, or critical public health and safety issues, WisconsinEye is providing the kind of coverage our citizens and civic leaders need to make informed decisions about our state’s future. “We feel like we have a role to play in these conversations,” says Henkes. Jason A. Smith is the associate director of the Wisconsin Academy and editor of the organization's quarterly magazine of Wisconsin thought and culture, Wisconsin People & Ideas. Social Media and Political Organizing: Slacktivism or Game-changer?